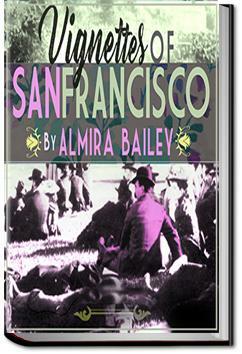 A collection of observations and stories about San Franciscan life - the people, the buildings, the parks, the food, the street-cars, the bay, Alcatraz, the sounds and the smells and the characteristics and idiosyncrasies of this fascinating city. Excerpt...IN the same way that the poets have loved Rome and made their pilgrimages there - as good Moslems travel toward Mecca, so there are some of us who have come to San Francisco. Then when we arrive and find it all that we have dreamed, our love for it becomes its highest tribute. . . .help their roving, and others are very tired and would like to lie over in port for or a long spell. There are Italians, and Portuguese, and many Greeks, and turbaned Hindus, tall and skinny, always traveling in pairs like nuns. Sometimes the Port is fairly crowded. New England is a section of the country where men leave home, and I have heard mothers sing with tears in their voices: "Oh, where is my wandering boy tonight?" On Third street down at the Port o' Missing Men, I have a fancy that I would like to write back to all those mothers that here are their boys. But, after all, what good would that do, for who can tell which is which? Oh, the things our eyes discover as we walk along on Market street. Such a medley—infinite, incongruous, comical, pathetic, motley and sublime.